The area remains the richest area of the country for dairy products and agriculture. 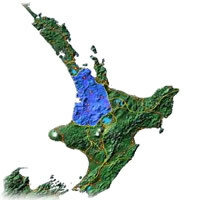 Hamilton, an hour and a half south of Auckland by car is the main city of the Waikato region. While the Waikato region is renowned for its farming strength, it also offers some spectacular tourism attractions. Visitors to the Waitomo Glowworm Caves never fail to be amazed by the splendor and beauty of the limestone formations. Further activities include wildlife tours, gardens, museums, river activities, thermal hot springs, and farm tours. Explore an enchanting world of secret gardens. Transport yourself through time and to far-flung corners of the world. Meander through a lush tropical jungle, visit ancient China and indulge yourself in a Renaissance Prince's 16th century garden. Hamilton Gardens is a conceptual garden and is the Waikato's most visited tourist destination. Located in a central city building, WIE is in the heart of Hamilton, just 1-2 minutes walk from both Hamilton Transport Centre and Hamilton City Centre with its many shops, restaurants, theatres and entertainment. A wide range of quality courses and programmes including General English at 6 levels (academic and general), IELTS Preparation, and English for High School Preparation. In Waikaretu, 1 hour north of Raglan, 1.5 hours S.W. of Auckland, Nikau Cave is a 1 km long limestone cave with thousands of glowworms, wonderful formations and few people. On a sheep and cattle farm with extensive gardens. Guided tours take 1.5hrs. $35 per person. Bookings essential. Meals available on request. Private cabin accommodation and backpacker accommodation. Organized bus tours departing from Rotorua allow to visit the Hobbit movie set in nearby Matamata. Hobbiton, north of Tirau in the Waikato region, has guide tours of the Shire in Middle Earth where some of the filming for the Hobbit film trilogy was made. Hobbit holes and Green Dragon Inn can be visited in this picturesque farm land setting with sightseeing transport during the day from Rotorua. One day privately guided and three day walks amid ancient trees in the forested heart of the North Island. Walks led by the Tangata Whenua (original people of the land) in a superb temperate rainforest location close to the tourism centres of Rotorua and Taupo. All packages are all-inclusive and full catered, with professional guiding.